The establishment would rather gut the party than allow Jeremy Corbyn to lead it. So the day after Britain voted to leave the European Union, with Prime Minister David Cameron having announced his resignation and the Conservative Party in chaos, two senior Labour Party figures resolved not to attack their opponents when they were weak, but rather to turn their fire on their own leader. They submitted a vote of no confidence in Jeremy Corbyn, the left-winger who was elected with a thumping majority less than a year ago. But because they mistook their long-standing grievance for a plan and their own echo chamber for the clarion call of insurrection, their strategy pretty much stopped there. Labour succeeded in effectively humiliating its own leader, but the party establishment is a long way from deposing him. Corbyn had stood on an anti-austerity and pro-peace platform, against a bland range of managerial nonentities who stood for little beyond office. Among the party’s grandees, his victory was not understood as a signal that Labour had to make a left turn in order to hang on to its base. Instead, it was received as a huge collective brain fart by a disgruntled membership that could no longer be entrusted with the grave responsibilities of democracy if they were going to make such bad choices. Having failed to come to terms with the root causes of Corbyn’s victory, the grandees had no candidate to replace him, no alternative policies with which to challenge him, and no notion of how to win over those members and unions who had chosen him. For nine months, the party’s establishment has obsessed over how to get rid of the man whose leadership it never considered legitimate. And this was what it came up with: a tantrum. There were two pretexts for this attempted coup. The first was that Corbyn had campaigned to remain in the EU with insufficient zeal. The other was that with Cameron gone, a general election scheduled for 2020 could well be brought forward, and Corbyn couldn’t win it. The poor couldn’t wait. Meanwhile, it soon became clear there was little likelihood the general election would be brought forward. Since the coup’s plotters didn’t have a candidate, there was no saying whether the party would stand a worse chance under Corbyn than anyone else. There are genuine reasons why some Labour supporters are disappointed in Corbyn. His performance in Parliament has been lackluster, and he’s been unable to maneuver around a hostile media. Given the fierce opposition he’s facing from both the media and his own party’s establishment, he needs a strategy for making his leadership work. It’s not clear he has one. But the truth is that the party establishment had been planning this putsch from the moment he was elected. Its members were no more likely to accept Corbyn as their leader than the Democratic National Committee would have accepted Bernie Sanders as the party’s nominee. They felt this was their best shot at getting rid of him, and they took it like vegans on safari: They set out to wound their prey but had neither the stomach nor the capacity to actually finish it off. In all of this, Corbyn has resembled nothing so much as a 17th-century witch being dunked in a river: If she drowned, she was judged to be innocent of witchcraft; if she floated, she was deemed to be a witch and executed. 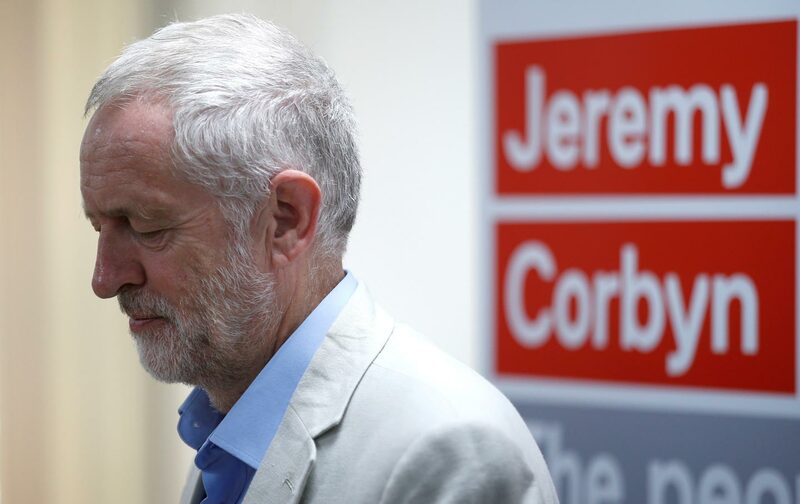 Corbyn really can’t win with the party’s elites, not least because his victory was the problem. The MPs who launched the coup described him as selfish. Corbyn’s insistence on his democratic mandate was evidence of his indifference to the fate of the party. To stand and win the first time was an act of provocation; to be deposed, stand again, and maybe win again was plain bad manners. Just a few days after Brexit, Corbyn’s shadow cabinet started jumping ship. The resignations were coordinated—on the hour, every hour; you could set your watch by them. More than 20 people resigned within the span of a few days. When Labour MPs held their vote of no confidence, 172 voted for Corbyn to go; just 40 backed him. Weeks later, a candidate was chosen: Owen Smith, an uninspiring man who was simply not in Parliament when the worst of the Blairites’ crimes against social democracy were committed (he was a lobbyist for a pharmaceutical company). So Labour has effectively succeeded in humiliating its own leader, but the party establishment is a long way from deposing him. At the time of this writing, Corbyn has 54 percent of the membership’s vote, Smith just 22 percent. When the party elites launched this coup, they were so convinced of their own genius that they didn’t bother to check if anyone shared their lack of vision. There is nothing to celebrate in any of this. While the Tories get on with the business of ruining working peoples’ lives, Labour has spent the last month waging an utterly futile war against its own base. Concentrating on Corbyn while refusing to address the root causes of his appeal, they have effectively assembled a circular firing squad and then shot themselves in the feet.